Nick Compton and Nick Gubbins hit centuries as Division One leaders Middlesex piled on the runs against Durham at Lord's. Compton (131) hit his first ton of the season in only his second game back since taking a break from cricket after the Test series against Sri Lanka. 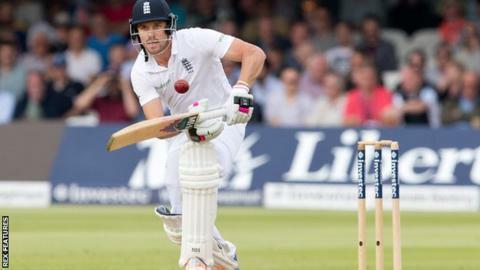 He shared a 247-run second wicket stand with Gubbins who top scored with 145. Graham Onions (3-76) took two quick wickets after tea, but Middlesex closed on 408-6, a commanding lead of 204. Gubbins, who had been dropped on 39 late on day one, hit 19 fours and one six in a six-and-a-half-hour stay at the crease. England fast bowler Mark Wood had the Middlesex opener caught in the slips by Scott Borthwick, leaving him just a single short of becoming the first batsman to 1,000 first-class runs this season. Compton, who made just 51 runs in five innings in his three Tests for England this summer, brought up his 100 off 193 balls before he was bowled by Onions after tea. Former England fast bowler Onions then had Dawid Malan caught behind by Michael Richardson as Durham checked the onslaught, before Stirling (43) helped take the hosts past 400. The partnership of 247 between Nick Gubbins (145) and Nick Compton was Middlesex's best for the second wicket against Durham in the 24 years since the north-east side began playing first-class fixtures. They fell a little short of Middlesex's all-time best second-wicket partnership of 380, set by Jack Hearne (204) and Frank Tarrant (198) against Lancashire at Lord's in June 1914 - just a month before the First World War broke out. Middlesex's all-time record partnership, an unbroken 424 for the third wicket against Somerset at Lord's, was set by Nick Compton's grandfather Denis, in the company of Bill Edrich, one of the many high points of the great 'Compton and Edrich Summer' of 1948.